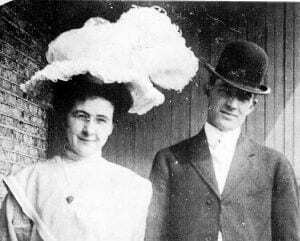 Anna Emalia Knaff (1883-1954) met Frank James when she was working at Chicago’s Marshall Field’s Department Store. A fire had broken out at the Iroquois Theatre nearby. She ran into the street to assist, and met her future husband Francis Marion James (1880-1931), as he was dragging dead bodies out of the theatre. In years to come, Anna brought her seven children, as well as her grandchildren, back to Marshall Field’s every Christmas to see the store’s magical windows filled with fanciful Christmas displays. Inside Field’s, they stood in wonderment before the giant five story tall tree that graced the store’s atrium. Then came that special visit with Santa Claus, to whom they whispered their Christmas wishes. During the year, Anna brought her granddaughters to the store’s dining room. There, she taught her granddaughters to luncheon like ladies, and to always wear white gloves. Little did any of us know then that the Marshall Field family and the James are distant cousins, through our mutual kin in Colonial Virginia.